Perhaps the irony of having the only English dude in the office write a piece on the 4th of July has dissipated somewhat. I’ve been here 10 years now, and learned pretty early on that wearing a red coat around this time was not a good thing. My first Fourth Of July was in New Orleans by the Mississippi, and while I have been to my share of Bonfire Nights in the UK, which are of a comparative size I suppose, given the scale of the surroundings – this was something else entirely. In the same way that the first time I went from JFK to Penn Station and stepped out into a place that was familiar from movies and lost my bearings, New Orleans was pretty damned filmic, and I felt transported by the occasion. Everyone was waving a flag on the Moonlight Mile, and the colors of the fireworks were as bright in the water of The Mississippi as they were overhead. It definitely hit all the right emotional buttons, and I realized at that moment, perhaps more than I had before – and I had seen Martin Luther King Day Parades, and St Patrick’s Day Parades at this point – that America is really great at celebrating itself. Everyone gets caught up in it, and it doesn’t matter what the word American means to you – you are allowed to be that kind of American on days like this, and politics really do seem to be put on the back burner. 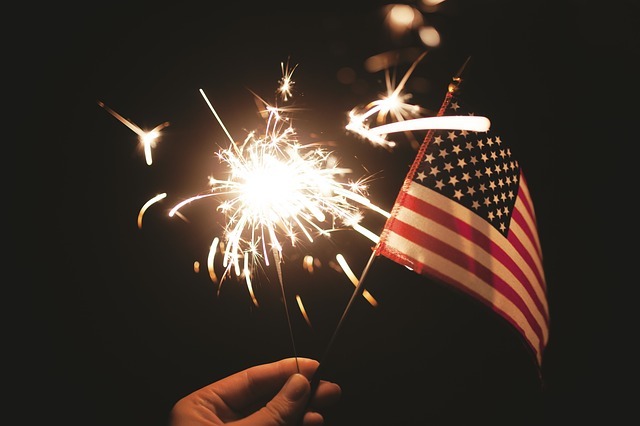 Everyone At Buzzazz Wishes You Happy 4th Of July! There are not many countries in the Western World that I have seen that are quite so happy to be where they are, and who celebrate that on such a scale. I have a memory of the Silver Jubilee in the seventies in the UK that tapped into a similar vein of feeling, but the amount of food and the amount of fireworks really does register with you. People put a lot of effort into the event. Behind the scenes people are cooking. People are making costumes. People are planning fireworks. The machinery in the back of the whole event is almost as impressive as the final explosive display. Filming these kind of things, or writing about these things, or even just witnessing these things, you really are seeing what is the very best about America. Take a picture of the entire cross sections of different demographics engaging unselfconsciously in these events, and you have your public relations materials handled. Underpinning it all is the Declaration of Independence. There is a lot of brilliant thinking in back of these celebrations – they really do have a great significance – and somewhere amidst family, food and fireworks, an almost holy trinity for holiday days, people do remember the reason for the celebration. And after the remembrance has occurred they go on to celebrate the fruits of that victory.